Law Enforcement :: Coda Octopus Products Ltd.
Municipal water features provide an easy disposal method for criminals, making critical evidence difficult or seemingly impossible to recover. 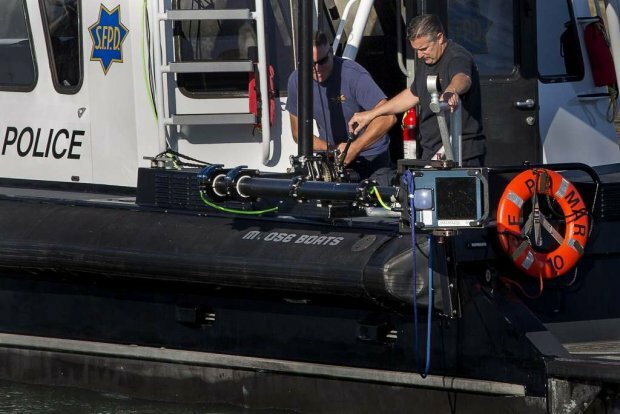 The Coda Octopus range of real-time 3D sonars gives the law enforcement community ‘eyes’ under the water, significantly increasing the probability of recovery of vital evidence, or detection of displaced items or objects. The CodaOctopus® Underwater Inspection System (UIS) gives 24-hour instant access to an easy-to-understand subsea view, even in zero visibility waters, and is already making a contribution with a number of high profile law enforcement agencies. Current UIS operators have used the system to great effect to recover a wide variety of evidence including small firearms on the seabed, large drugs shipments and identification of victims and evidence in search and rescue missions. For complex structure surveys, whether as part of a routine maintenance survey or a response to an urgent problem, our real-time 3D sonars complemented with our powerful top end real-time 3D visualization software provides users with live, easy-to-interpret results for use by hydrographic and non-hydrographic trained personnel alike. When divers are deployed in critical subsea operations, it is paramount for top-side dive supervisors to maintain clear and constant visibility or the dive site at all times. The Echoscope®, our flagship real-time 3D volumetric sonar, instantly visualizes moving objects underwater live and in 3D, despite zero visibility water conditions. For all military and security personnel, instant information regarding subsea threats is a necessity to ensure the safety of the public and the crew. Our real-time 3D volumetric sonar, the Echoscope®, is capable of providing a live, 3D volumetric image of the subsea environment even in zero visibility waters. Looking for either suspended objects in the water column or sunken assets on the seabed is a difficult task. The Echoscope® uses proprietary beam forming technology to produce a volumetric swath capable of locating critical evidence that has been disposed.